Toby and Aaron both find themselves living at Captain Thomas Coram’s Hospital for parentless children, but their histories are as far apart as they could possibly be. Toby has been rescued from a life of slave labour in a faraway country; Aaron is the illegitimate son of the heir to a large country estate. They are watched over by Mish–a simple soul who has been with them since their arrival. His devotion to them is absolute, but his motives are not altogether straightforward. Could this curious man really be Meshak, the son of a wicked child-killer who was hanged at the gallows for his crimes? 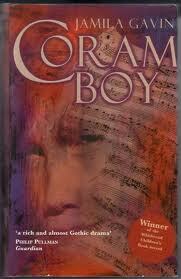 Coram Boy is on our UKYA Top 100 list. Categories: Historical, Thriller | Tags: Jamila Gavin | Permalink.